Art Synergy is a countywide movement to unify and promote the diverse culture of Palm Beach County’s vibrant arts community. The movement begins with a program of events surrounding ArtPalmBeach – considered one of the most influential comtemporary art fairs on Florida’s Gold Coast by both critics and art enthusiasts, with over 80 international galleries exhibiting contemporary and emerging artists. The inaugural Art Synergy gallery walk will include satellite exhibitions at six historic art districts through the county from January 22-27 – featuring gallery receptions, open artist studios, performances, lectures, tours and special events. Learn a little about each of the districts below. In partnership with the West Palm Beach Downtown Development Authority, Continuum will have a diverse representation of artists of different disciplines partnered with music to keep the momentum of the DDA’s vision of being the arts and entertainment hub of Downtown West Palm Beach. World-famous Worth Avenue is mere minutes from the main ArtPalmBeach show, just across the Royal Park Bridge. This special art walk includes galleries all along the fabulous art and shopping district, as well as the Liman Studio Gallery in the historic Paramount Building a few minutes to the north. Friday, January 24 | 6 p.m. – 1 a.m.
ART al’Fresco is a one night fashion, art and culture exhibition and celebration which will feature unique art experiences at Boynton Beach Arts District (BBAD). ArtPalmBeach ticket holders will enjoy access to a VIP catered area and meet-and-greet with some of ArtPalmBeach’s main speakers and presenters. A FREE luxury bus tour sponsored by the City of Boynton Beach will offer entertaining and informative transportation to and from the Convention Center. You won’t want to miss this! Saturday, January 25 | 6 p.m. In recent years, historic Northwood Village has emerged as one of the most inviting, eclectic, funky and hip micro-communities in South Florida. ArtX will include a guided art walk of the district’s galleries, followed by a fashion show by Fusion Fashion & Art at 9 p.m., with over 50 artists presented on the runway. Sunday, January 26 | 12-7 p.m. 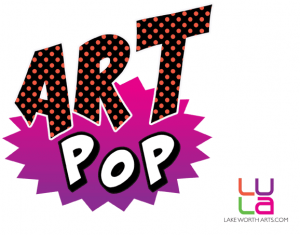 The first art walk at Lake Worth’s Urban Arts Lofts will include live art demonstrations, assemblage of an air sculpture, musical and dance performances, ceramic creations, handmade drums and custom built furniture. Art POP’s main event will feature 11 different galleries open to the public. Sunday, January 26 | 4-6 p.m.
On this short stretch of Dixie Highway, you’ll find a charming district with over 40 antique shops offering an impressive selection of 17th to 20th century antiques, fine and decorative arts, period deco, vintage and moderne furnishings, and much more. Participating galleries will be open January 24-27 from 6-9 p.m., with a special art walk on Sunday, the 26th.